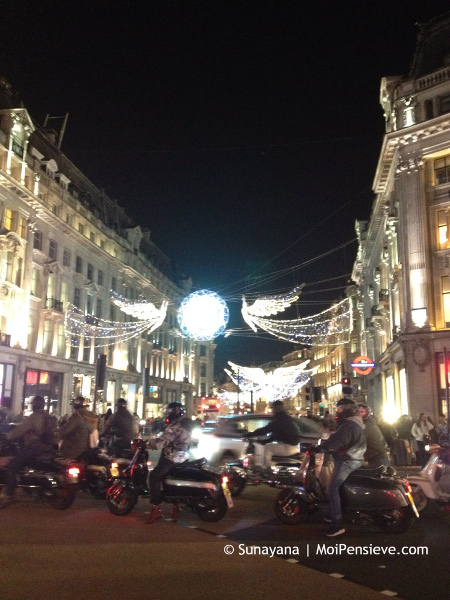 They rode through the city on their scooters on Angel’s Eve just before midnight. They rode through the avenues just as their parents and grandparents had before them. The streets were filled with celebrants and anticipation. They could only hope that this would be the year she would return. The brightly lit banners, all white and feathered, adorned every boulevard and byway. Just a few minutes left. The Dunnmerry riders arrived in the square. They got off their scooters and looked up expectantly. Midnight came but not the Angel. They would have to wait another year and hope she would return to free them from the occupiers. The lights went off and a voice crackled out of loudspeakers all over the city. Written in response to FFfAW Challenge-February 14, 2017. The challenge is to write a flash fiction story, based on the photo prompt above, between 100 and 175 words, with 150 being the ideal target. My story comes in at 173 words. Wow, James, such a chilling story! The entire story was full of hope and anticipation then at the end it felt like hopelessness. Great story! Thanks. It was one of those stories that I mentally composed as I typed. I wasn’t sure how it was going to end until it ended. Haha! That is how I write my stories! Ooh, definitely a chilling story like PJ said. Interesting take on the photo! Thanks. Actually Jade, nothing immediately popped into mind when I first saw the photo except the first sentence. I had to struggle a bit to find a hook. Good one, very engrossing and nicely told! I suspect the Angel may be a story created by the Commandant in order to give the workers a little hope each year and stop them rebelling. Actually, that hadn’t occurred to me. I was thinking of the Passover. As part of the Passover seder, at one point, the children present are sent to the door to see if Elijah has arrived. According to custom, when the Messiah is about to come, the Prophet Elijah is supposed to appear for the Passover meal at a Jewish household. A place is set for him at the table each year just in case he shows up. From a Jewish perspective, someday he will as a sign of hope that the Messiah is soon to come. May the Angel come soon and in our day. Liked the concept of an angel bringing hope to the miners, working below ground is soul draining – inspiring tale about keeping hope alive. Chilling and Interesting tale. I always write from my fingers on these prompts makes it much more fun that way. Good take Grandpa.